Traditional blessing ceremonies for all that is new and special in your life: marriage, baby, home, your business, landmark events, your land, boat, plane and your furry companions. Spiritual guidance based in Hawaiian tradition from a Hawaiian life guide. Traditional Hawaiian values and how they can help your business and family relationships be more fulfilling and successful. Tools & techniques to help you live a happier, peaceful and meaningful life. Educational cultural & spiritual tours to sacred places on O`ahu. Educational & entertaining products to enjoy and share. The fastest way to get the help and information you’re looking for is to go to our Contact Us page and email your request. We’re so happy to say that this exciting book has sold out many times over at all of our bookstores we can’t keep their shelves stocked. The ever-changing faces of mahina (the moon) not only appeared as a celestial almanac, it served as a spiritual guide for the ancient Hawaiian kahuna’s mystical practices. 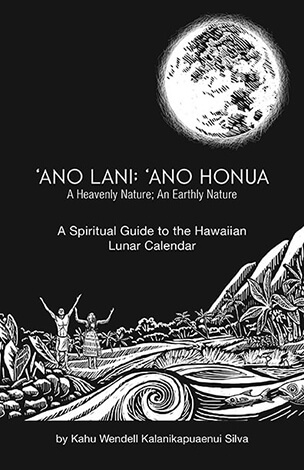 In the new book `Ano Lani; `Ano Honua – A Heavenly Nature; An Earthly Nature, the sacred connections between the supernatural rulers of the heavens and humans on earth are revealed for the first time. Readers can discover the secret world holistically shared between the Hawaiian gods, nature and man. Learn how the heavens and the kahuna spiritually guided the earthly journey of the human soul. Learn how you can guide your own journey with this knowledge. What is this Site all About? What Are Kahuna Teachings? Kahuna teachings represent the sharing of a precious legacy of knowledge and spiritual wisdom handed down to kahu Wendell Kalanikapuaenui Silva from generations of his cherished ancestors and his many mentors who are beloved as Hawaiiʻs cultural luminaries. The teachings, information and insights included here are presented for the purpose of educating, enlightening, to increased understanding of the traditions of the Native Hawaiian people and to perpetuate and preserve their unique culture and profound spirituality. We sincerely hope this website becomes your home and your community – a place to find help, to nourish your body, mind and spirit, find comfort for the soul and to learn about our Hawaiian values which we share in common with the family of man. Deeply meaningful, inspiring treasures only available here. Hawaiian Birth Signs - Book. Hawaiian Birth Signs - Audiobook.